Henry Brown joined the Hunslet Engine Company, a Leeds-based locomotive manufacturer, as new products manager and, within the year, he had produced the prototype of a tiny, four-wheeled car, which had none of the obvious disadvantages of his first attempt. 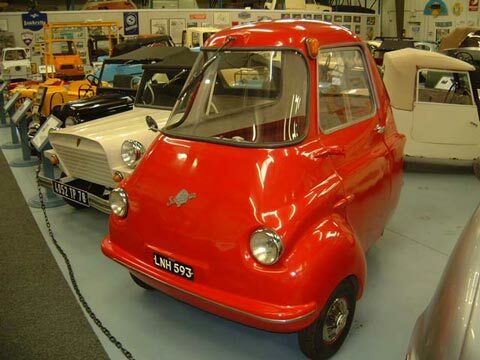 The prototype was powered by an Anzani engine, which suffered severe overheating problems but, by the time the Scootacar went into production in 1957, it was fitted with a Villiers 197 cc two-stroke unit. The renamed car had been restyled too. It was now a three-wheeler, two at the front and one at the rear, with the alternative of two smallish children fitting in the rear. The Scootacar was well-built with a sturdy chassis incorporating a steel floor upon which the fiberglass body was fitted. It was inexpensive and qualified for low-band road tax and also economic. The original version of the Scootacar has become known, in retrospect, as the Mk 1.